The engineers at Yamaha definitely have an appreciation for vintage scooters, and they prove it once again with the 2015 Vino Classic. According to the factory, it combines classic design features with modern engineering to produce this reliable and stylish ride, and judging by the pictures, they succeeded big-time! 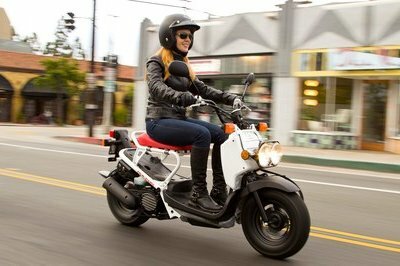 There is no denying the retro-classic good looks, and if you consider the excellent gas mileage and reliability provided by the fuel-injected four-stroke engine, you cannot help but feel that this could be a nearly perfect form of transportation in scooter-friendly areas. Yamaha took a page from history when designing the Vino, and borrowed from the looks of the classic, Italian-made Vespa by Piaggio. But don’t think for an instant that this is a cheap knock-off. Though it pays tribute to the scooters of yesteryear with its pleasing lines and time-tested layout, it is not a direct copy of any single scooter and the quality is definitely there in spite of the reasonable price. Plus, the retro style is a refreshing break from some of the other modern scooters that look a bit too much like they had been crossbred with a European tour bike or even worse, a sportbike. This faithfulness to its roots is certain to appeal to riders who are searching for honest transportation that doesn’t seem like it is trying too hard to be something that it clearly is not. Seat height is a fairly low 28.2 inches, and while the step-through design provides generous room for shorter riders, the taller crowd may find the foot room on board to be a little cramped. The 90/90 R10 tires front and rear look somewhat small, but they are proportional to the rest of the scooter and provide a decent contact patch where the rubber meets the road. A telescopic front fork with 2.3 inches of travel smoothes out the bumps up front and a single rear shock with 2.1 inches of travel reduces the kidney-jarring jolts coming through the rear end and into the seat. 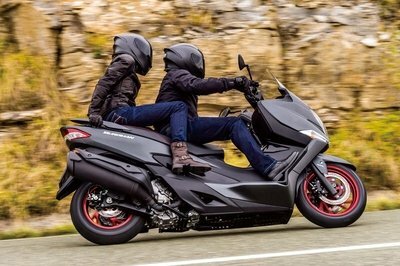 Granted, this isn’t quite as cushy as the 4-plus inches of suspension travel on the Yamaha TMAX, but to be fair, the TMAX is a lot more scooter. Both the front and rear are drum brakes, which are generally much weaker than disc brakes, but given the light weight of only 179 pounds they should be more than sufficient to keep this scoot under control. Under-seat storage provides enough space to keep your helmet out of the weather, carry a backpack or even do some light grocery shopping. Power comes from the 49 cc, liquid-cooled, four-stroke engine that incorporates three-valve head construction and electronic fuel injection to give this powerplant its reliability and phenomenal gas mileage. Besides these desirable qualities, one big selling point is the fact that in many areas, vehicles with engines 50 cc or smaller do not require licensing or insurance, and in England it can qualify as a learners bike under their stratified licensing system, requiring only an AM license. Compression is rather high at 12 to 1, but I imagine the factory had to make it that high to boost engine power and meet emission standards, but Yamaha makes no mention of high-octane gas requirements so it should run just fine off pump gas anywhere in the world. The transmission is of the fully automatic v-belt design, with a dry centrifugal clutch that provides easy twist-and-go operation with low maintenance requirements. Unit price is definitely one of the best features of the Vino. 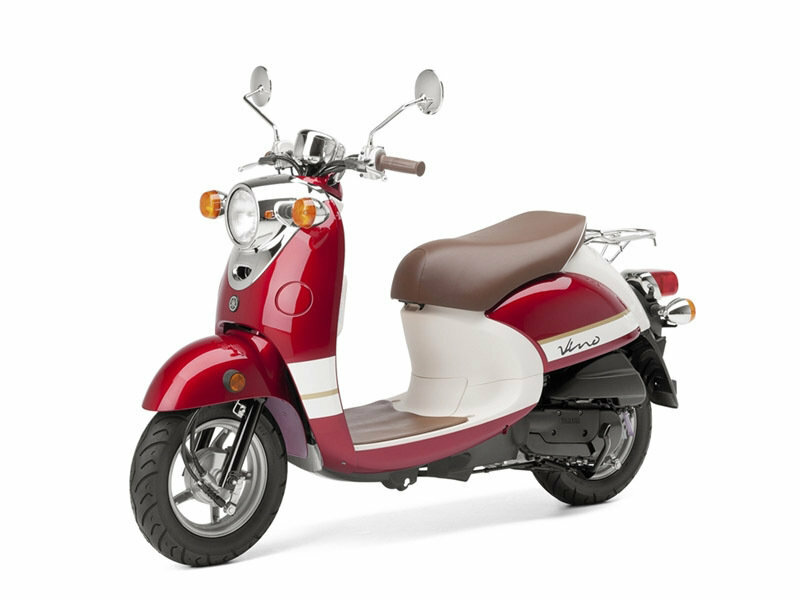 It is available for the same low price as last year’s, at $2,290, which puts it well below that of comparable scooters (read: Vespa) while maintaining style and quality. 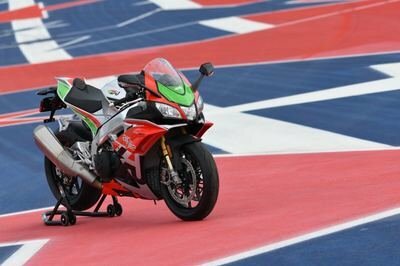 Typically, color options can inflate the price a bit but Yamaha sidesteps this issue by offering the 2015 Vino Classic only in Spartan Red, which to me looks a lot better than last year’s Deep Blue Sea/Vanilla White with red accent stripe. Don’t get me wrong, red, white and blue looks good on a flag, but on vehicles, not so much. "Those of you familiar with my writing will know that I have a soft spot for retro/classic/vintage designs, especially when they incorporate modern technology. This scooter leaped off the page at me with its dated design and classy style, and while I don’t have any use for such a small ride, I can’t help but be intrigued by the Vino." My wife and fellow writer, Allyn Hinton, says, "I like the vintage look of the 2015 Vino Classic. 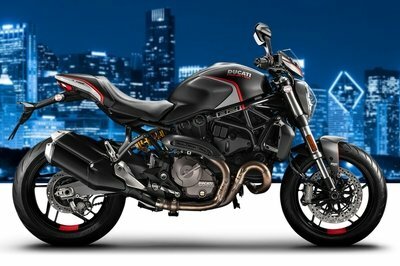 It’s the nostalgic version of its brothers, the Zuma 50F and Zuma FX, though the Zumas have front disc brakes. For these light little scooters with a 50 cc engine, drum brakes have plenty of stopping power. 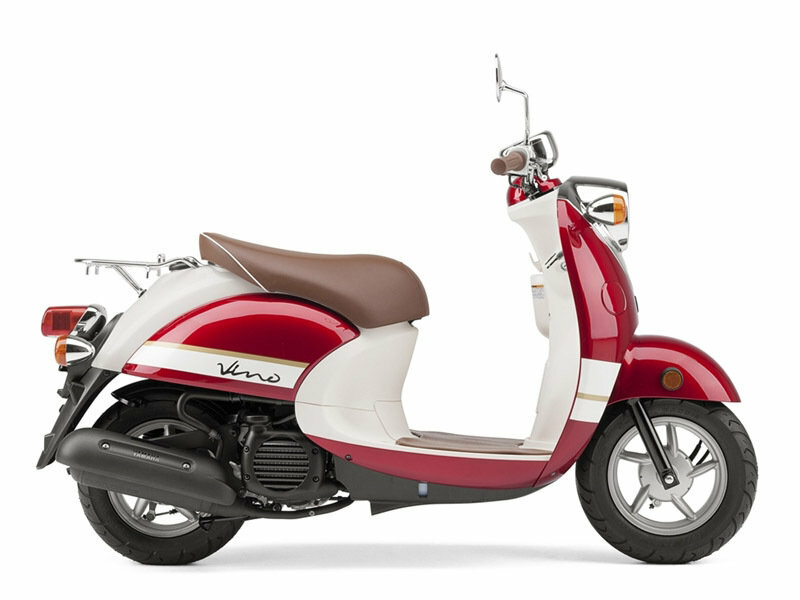 Compared to Vespa scooters like the Primavera 50, LX 50 4V and S 50 4V, the Vino gets better gas mileage and is less expensive — as much as $1300 less — but the Vespas come with a two-year unlimited mileage warranty versus the Vino’s one-year limited warranty. All things considered, if I had the need to ride a 50 cc scooter, I think I’d want the 127 mpg the Vino gives me. It’s just an awesome looking little scooter."